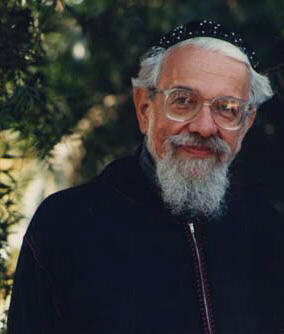 The following address was given by Reb Zalman to the Oberlin College graduating class of 2003, which included Reb Zalman's son, Barya. For this moment, which we got to live, to experience, and to celebrate we give thanks: Shehechiyanu! You join the symphony of the whole Earth. voices echo joy in God's halls. In giving thanks we engage Her blessings. Her encouragement from generation to generation. You are filled with joy serving God's purpose. You sound your own song as you do it. both God's companions and His flock. Thank You God, You are all Blessing. In this world You are goodness, Yes, Grace itself. This is the trust we bequeath the next generation. as we find ourselves in a dark tunnel. There are many sore places of the planet. to the polluting or soil, air and water. is brittle and short fibered. only with intensive and serious maintenance. while lining the pockets of the rich. Onto the shoulders of nearly bankrupt states. The road ahead is not smooth. And still we are now celebrating a graduation. and live the good life. in a sparse job market. and to those with whom you will interact.